My dog has had clear white dots right in the middle of BOTH of his eyes for some time now. I'd say 2 months or so, but could have been longer due to the fact that they are simply very hard to notice by eye unless you catch it in the right angle/light. When I first discoverd them 2 months or so ago, I thought nothing of it. I thought since dogs play in the sun, and they look up into the sun while you throw stuff, perhaps their eyes get burnt by sunlight or something stupid like that. Well for whatever reason I became concerned and started doing searches online, and learned those are not normal. So I went to my local vet, and she said it could possibly be pannus, but is very easily treated by medication, and that I should just monitor its condition/growth if any, for the time being. Here is another condition, known as corneal dystrophy, and this is pretty much how my dog's eyes look like. RIGHT in the center, in BOTH eyes, but it's CLEAR unlike what is shown in the picture, so very hard to see. Perhaps that's because it's in the early stages, I don't know. Does anyone here have any experience with this? 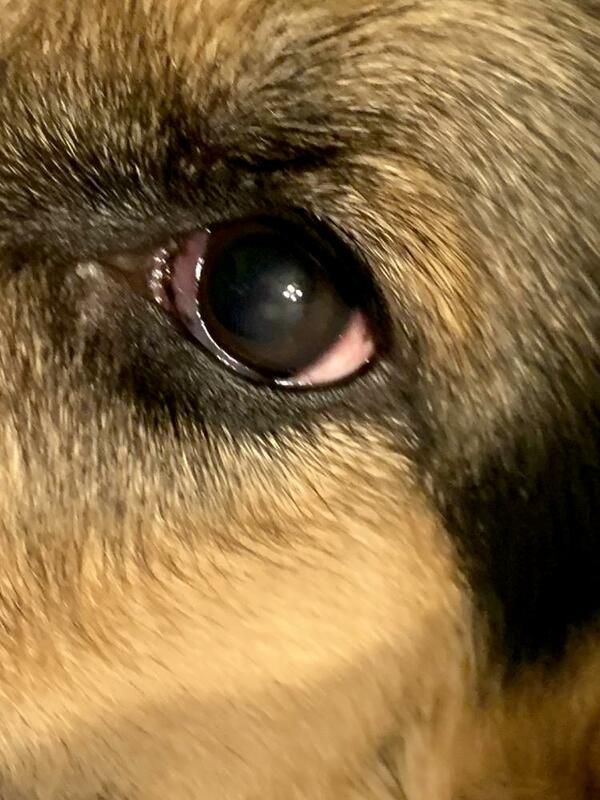 Can anyone please do me a favor and look into your dog's eyes and see if yours also have this tranluscent clear marking in the middle of the eyes? I am thinking of taking him to an eye specialst for more conclusive testing. I hope everyone's doing good. *again, that picture is NOT my dog's, but from a website. my dog's white dot is more clear and transparent, and slightly smaller in size. The last photo in my thread about Luna was how her Corneal Dystrophy started (as a smallish spot in the middle of her pupil) and all the veiny/redness around her iris was pannus. We got unlucky and have to deal with both lol. That said, your vet is correct - Pannus is a completely manageable disease and with proper treatment will not lead to blindness. It of course can be anything ranging from cataracts to dystrophy to just allergies, so you really should schedule an appointment ASAP with an eye specialist. It'll put your mind at ease and whatever is going on will be managed and controlled. My eye specialist when she diagnosed both the dystrophy & pannus, I asked "will she have problems seeing or go blind ever?" and she smiled and said "Oh heavens no." :lol: It'll be okay! Edit: I also wanted to say that I had to see a 2nd eye specialist because the 1st one brushed off the cloudy spot in her pupil. Turns out, one of the pannus meds made the dystrophy 100x worse (The 2nd specialist told me this, said it was the Neomycin antiobitic) and the dystrophy got worse QUICKLY (as in 3x the size it was in those photos in a month) because of those meds, so please be careful and get a 2nd opinion! Last edited by desinif; 03-24-2019 at 08:20 PM. hey desinif, i went ahead just now and read your old post, and quite a story!! hopefully your dog's doing better. 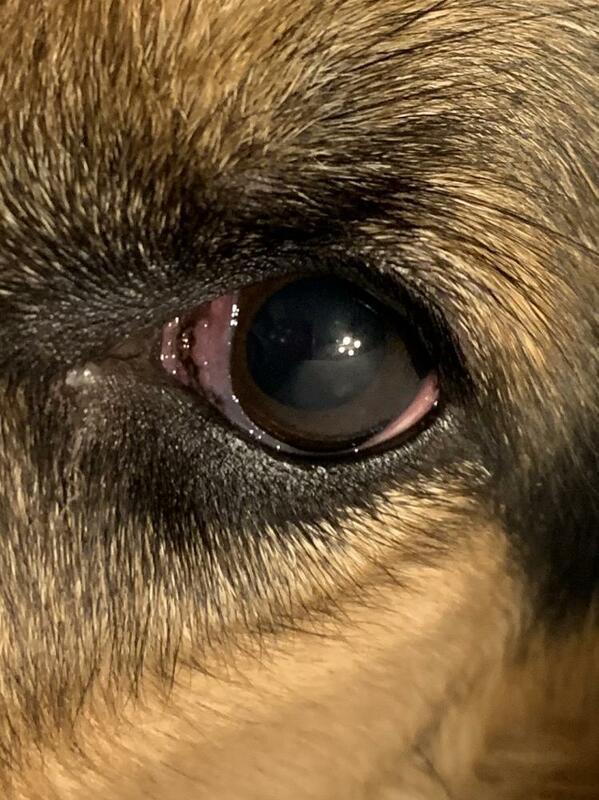 yea my dog's eyes are ALOT like the 3rd picture in your post, except the lining of the black part of the eyes are straight round, and no "bleeding out" of the iris yet. but the white opaque spot is kinda hard to see in your picture, my dog's is more easier to spot. i will try to get a close up picture later. i will definitely go ahead and set up an appointment this monday. will see when they will let me come in. and thanks for the tip about that one medication making dystrophy worse. will raise that concern with the specialist too. Pan, eyes are one of those things where you'll never regret going to a vet ophthalmologist for care -- they know more, have better diagnostic tools, and can simply offer more treatment options than regular vets. Eyes are complicated enough to not trust to a generalist (even a very good generalist) IMHO. Even in a worst case scenario like cataracts, they can do lens replacements on dogs to save the vision if the cataracts are caught early. I love, love, love the vet ophthalmologists who've cared for my dogs. As an example of how careful they are, when there was a small spot in my dog's eye that was inconclusive, they took elaborate digital photography and measurements, and had us come back in a few weeks to rephotograph and check measurements of changes. Most GP vets don't even have the equipment to do that kind of monitoring. Here’s an updated photo of the dystrophy I just took. Luna is doing great now and it’s a slow process but we have a handle on her problems now and her eye drops take a couple secs too &#x1f642; so we are doing good. I’m glad you decided to schedule an appointment. At the end of the day, eyes are very important and it’s worth erring on the side of caution. Let us know how it goes and keep us updated. Hello magwart, hope you are doing well ! Desinif, glad to hear your dog's on the mend. So I just went ahead and scheduled an appointment with eye specialist. This week is fully booked out, they had a few openings next week, but they were in conflict with my schedule, so I settled with next next week, which is exactly 2 weeks from now. Good for you, for scheduling the appointment. You do not mess with eyes. Hans has Pannus, and we have to apply two types of eye drops, once a day. This doesn’t cure it, but keeps it from getting any worse. So I just came back from my dog's specialist visit. And her official diagnosis was corneal dystrophy, which was my original suspiscion. I asked about my local vet's diagnosis of potential pannus and this specialist said there's not signs of that yet. So her take is this is genetics, and MOST cases do not progress any further and dogs live out normally without any negative effects to their vision. For today though, she prescribed this thing called optimmune, which is supposed to produce more tears that's in turn supposed to provide the cornea with more nutrients. Do that for 2 months, and come back 4 months from today. So I left the office relieved, and took my dog around for some sight seeing, etc. Just updating for those that care. Thx to everyone that chimed in. dogbyte, Bramble and GSDchoice like this.